The text is also large and very easy to see, and it is also appreciated that the check rod storage hook is also included. This review is about item#8748092. 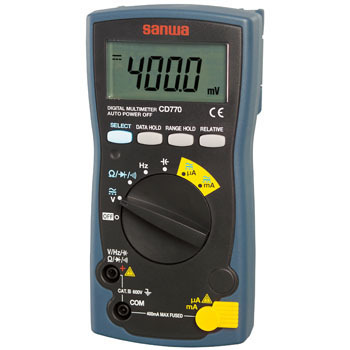 Good point Input resistance when measuring DC voltage, AC voltage is high · Orange and fixed range can be easily switched · Auto power off time is as long as 30 minutes Can cancel the auto power off function · Character is easy to see · Shape of the knob It is easy to use. Requested Please extend the measuring range of the condenser to 1,000 to 10,000 μF I am very satisfied with this product. Although the function is good, there is a test hook attachment hook on the rear side, it is thicker than I thought. Also, with the test leads attached to the rear mounting hooks, it is a difficulty not to be in the box. This review is about item#08748092.